Social Discussion was proud to be a part of ‘Call To Hope’ last week – Shepherd’s Hope Fundraising Breakfast in Orlando, Florida, which raised over $170,000. Check out the video we put together for their event. And please read this article from Scott Maxwell of the Orlando Sentinel. Last week, I watched two groups of people hold passionate discussions about health care. During one, doctors, pastors and patients swapped stories of inspiration and altruism, urging everyone to help as many people as possible. During the other, politicians tried to persuade one another to help fewer. A plan was afoot to help 1 million people. But most of the politicians wanted to scale the help back — by as much as 90 percent. At one, attendees talked about a moral obligation to help their fellow man and serve a higher power. At the other, leaders demonstrated their desire to seek higher office. The first event was a fundraiser for Shepherd’s Hope — a faith-based model of providing health care to Central Floridians that has become a national role model. The other was the legislative session in Tallahassee, where politicians are scrambling for excuses to turn away billions of dollars in federal money to provide health care for the poor. Both groups of people often quote Scripture. Only one of them lives the Gospel. Shepherd’s Hope is one of Central Florida’s homegrown triumphs. Sixteen years ago, the Rev. Bill Barnes of St. Luke’s United Methodist Church felt called to help the sick and needy around him — in a big way. Through the years, Barnes’ vision blossomed into a network of four clinics, staffed by more than 2,000 volunteers. Doctors, nurses, office workers, assistants and more. They now serve more than 20,000 patients a year. And the success stories will bring tears to your eyes. A former executive, hit hard by the recession, lost her job and house, then learned she had cancer. A woman who experienced rapid weight gain — only to have doctors at Shepherd’s Hope discover she had a 32-pound ovarian tumor. They are stories of lives saved. And when a roomful of health-care execs, business leaders, philanthropists and concerned citizens heard those stories in the ballroom at Church Street Station last Thursday morning, they responded with more than $170,000 in donations. Now, the cavalier may simply say: Good, that’s the way it should be. Private donations should serve that need. The reality is that, no matter how hard Shepherd’s Hope works, the line of patients at the clinics far exceeds the number that can be served on any given evening. They are often single moms who pulled their kids out of school early, hoping to see a doctor who might tell them why their little one can’t hear or breathe properly. That is why compassionate societies provide safety nets. It is also why this country has twice voted for a president who vowed to address that problem. Yet leaders in Florida are fighting that initiative tooth and nail. Florida House leaders are trying to reject federal money — more than $50 billion meant to help cover 1 million people. Instead, they want to spend state money and cover as few as 100,000 people. Yes, they want to spend more of Florida taxpayers’ dollars to help fewer people. That’s not just morally objectionable. It’s fiscally irresponsible. Unfortunately, no such attack of conscience has struck Florida House members — who pay $8 a month in individual premiums for one of the most generous health-care plans in America. In fact, House Speaker Will Weatherford declared himself “excited” about the plan to help 90 percent fewer Floridians. It was an odd emotion for man whose family received $100,000 in public health-care benefits back when Weatherford was young and his brother was battling terminal brain cancer. Weatherford actually mentioned his family’s help in a speech — before he realized that the money came, in part, from the same Medicaid source he is now fighting to keep from other Floridians. Weatherford’s father had to help correct the record. This is also, by the way, a jobs issue. When you’re talking about $50 billion, you are talking about money spent in the health-care industry — where jobs pay well. What’s more, Moody’s Investor Service recently reported that states refusing to expand Medicaid could threaten the bond ratings and financial stability of some hospitals. I’ll take my sermons from the folks at Shepherd’s Hope, thank you very much. The incorrect reporting of an arrest after the Boston Marathon bombings reminds me of another big story botched by the media more than a dozen years ago. But this was different. It wasn’t a national tragedy we were dealing with back then. It was a national election that turned the media into an international joke. The media became a joke again Wednesday. But it was no laughing matter. News organizations have always believed the most important thing to be…is first. First in information. First on the scene. First in video. Wednesday afternoon, CNN was first. First in getting it all wrong. Just before 2:00 o’clock, the Associated Press claimed “sources have confirmed” an arrest. It’s not clear, exactly, who their sources were. But if it was CNN, they had a big problem that was about to get even bigger. Minutes after the AP joined in the fray of ineptitude, CNN went further down the rabbit hole, deciding to give a description of the man in custody. A man who didn’t even exist. “According to my sources…” John King of CNN began telling the country. “The suspect is a dark-skinned male individual.” Apparently, CNN was the only entity to see the intrinsic journalistic relevance of that information. Information, by the way, which just so happened to include the Ethiopian runner who won the marathon earlier in the day in as a suspect. What bothers me most about King’s blunder, is that he didn’t give a description. He issued a characterization. It was useless, inflammatory, and did absolutely nothing to advance the discussion of the story. Other than to make CNN the story. Twenty minutes after that egregious report, John King and Wolf Blitzer were backtracking faster than Michael Jackson could moonwalk. But not nearly as graceful. By half past 2:00, CNN was forced to report “Conflicting Reports of Bombing Arrest.” Essentially telling us the Breaking News they’d been broadcasting for nearly an hour was wrong. And to remind us just how cataclysmic their mistake was, they continued to keep their Breaking News Banner on the screen. Basically, breaking the news that their breaking news was, well…broke. Around this time, the Internet began to snowball within the frenzy of inaccuracy. 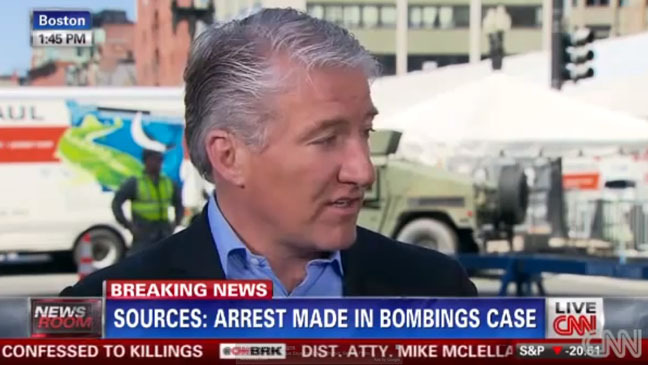 Boston.com reporting (in BIG BOLD LETTERS) MARATHON BOMB SUSPECT IN CUSTODY. And what about the New York Post? They were busy splashing photos of two men with a gigantic caption labeling the unidentified persons as, “BAG MEN.” Later in the day the Post issued an update. Again, prominently displaying the images of the “BAG MEN” on the front page, telling us those two men – the two men THEY incorrectly identified – had, in fact, been cleared. Never once bothering to apologize for their abhorrent mistake. By days end the media’s descent from “Speculation Mountain” was all but complete. But the damage had been done. We live in a world with a news cycle that never sleeps. There are cable outlets, and magazines, bloggers, Tweets and Facebook posts. Unnamed sources can be anyone with a keyboard or a cell phone. If you believe the line between journalism and entertainment is blurred, you’d be wrong. It’s non-existent. The journalistic bar has been set so low, we can now step on it. Still, that’s not an excuse to substitute being correctly 2nd with being 1st and wrong. The FBI issued notices to the media asking them to dial down the rhetoric. Imploring them to, “exercise caution and attempt to verify information through appropriate official channels before reporting.” I hope the media listens. I hope they show restraint and begin to display some respect. Not just to those who were injured or lost their lives. But to their families, the residents of those surrounding communities, and to the city of Boston. A city which, at present, finds itself in the middle of chaos, confusion, and lockdowns. While doing its best to make its way through a series of wakes.